Some words that are spelled differently but sound exactly the same. Some words that are spelled the same but are pronounced differently. 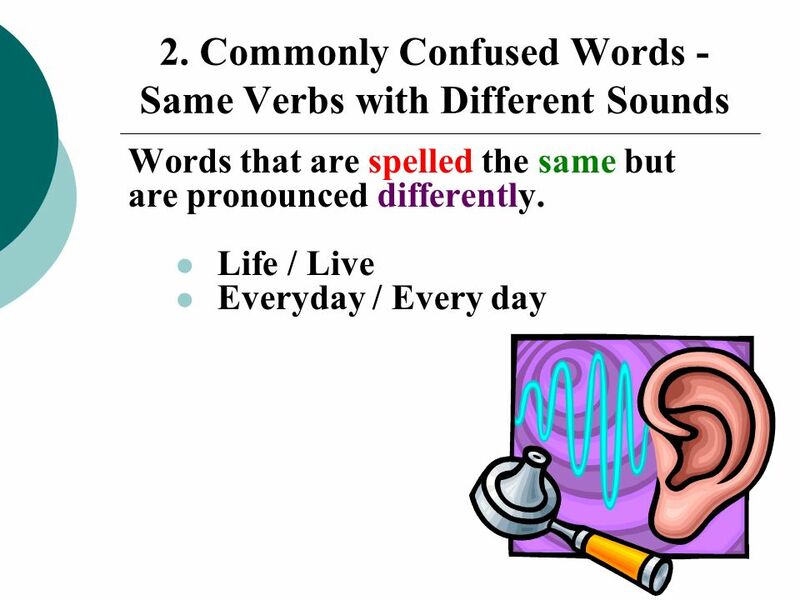 Some words that do not share the same spelling or pronunciation but are often confused. These are your commonly confused words. 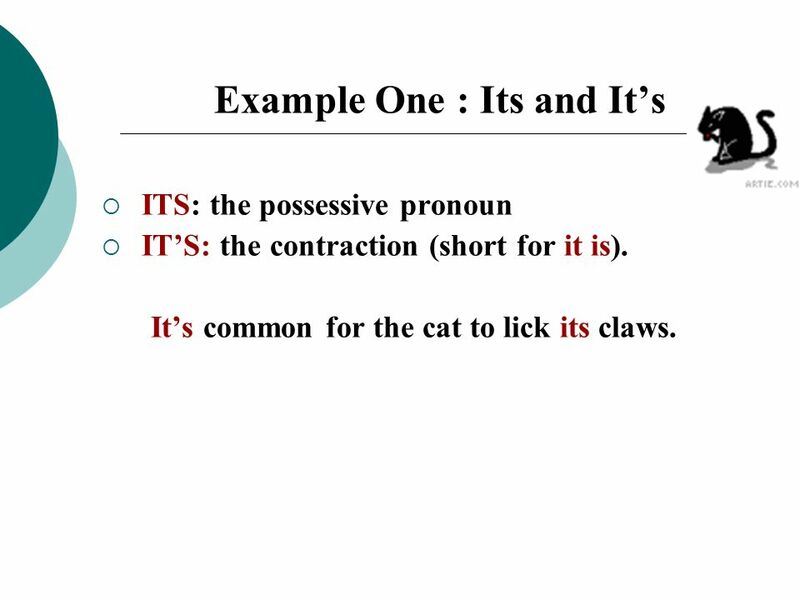 ITS: the possessive pronoun IT’S: the contraction (short for it is). It’s common for the cat to lick its claws. 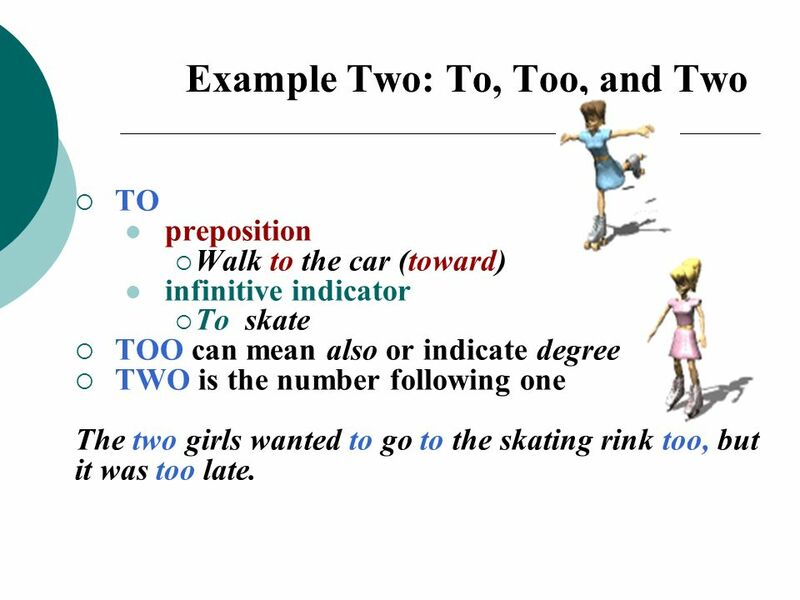 preposition Walk to the car (toward) infinitive indicator To skate TOO can mean also or indicate degree TWO is the number following one The two girls wanted to go to the skating rink too, but it was too late. 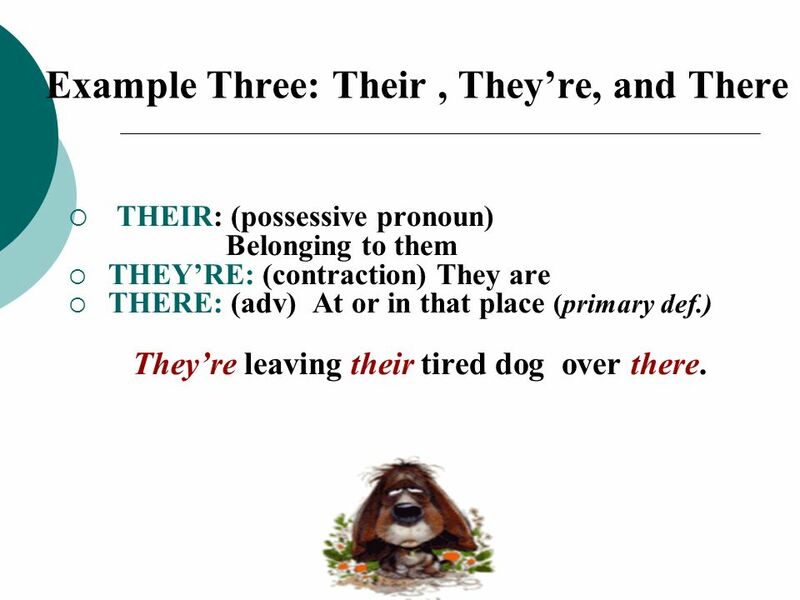 THEIR: (possessive pronoun) Belonging to them THEY’RE: (contraction) They are THERE: (adv) At or in that place (primary def.) They’re leaving their tired dog over there. 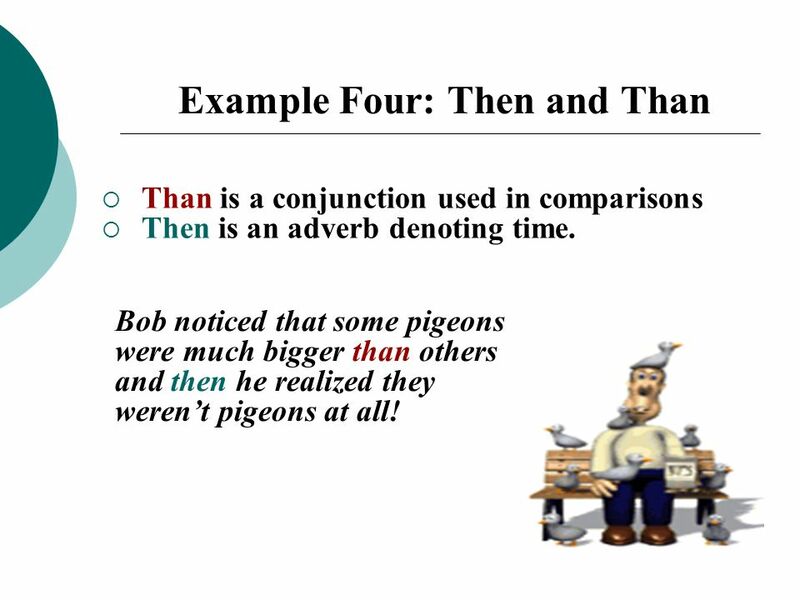 Than is a conjunction used in comparisons Then is an adverb denoting time. Bob noticed that some pigeons were much bigger than others and then he realized they weren’t pigeons at all! 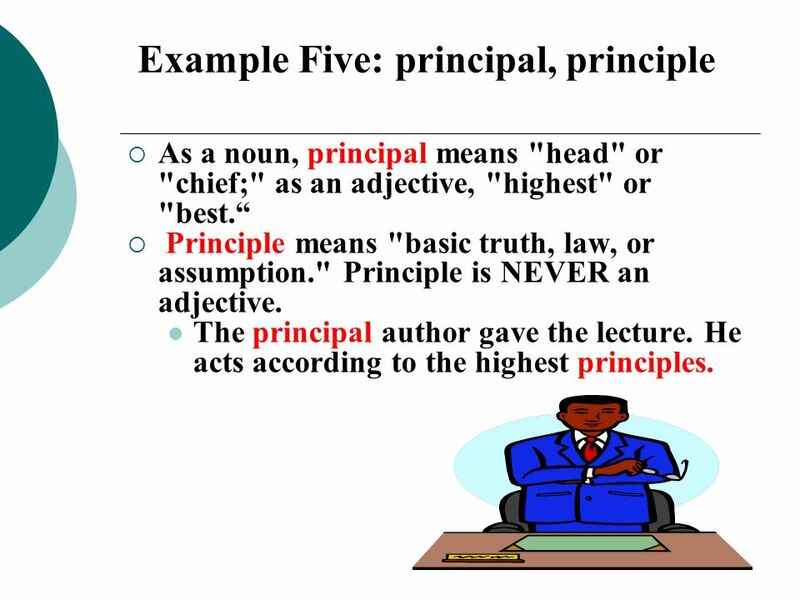 As a noun, principal means "head" or "chief;" as an adjective, "highest" or "best.“ Principle means "basic truth, law, or assumption." Principle is NEVER an adjective. The principal author gave the lecture. He acts according to the highest principles. These words can get very complicated. 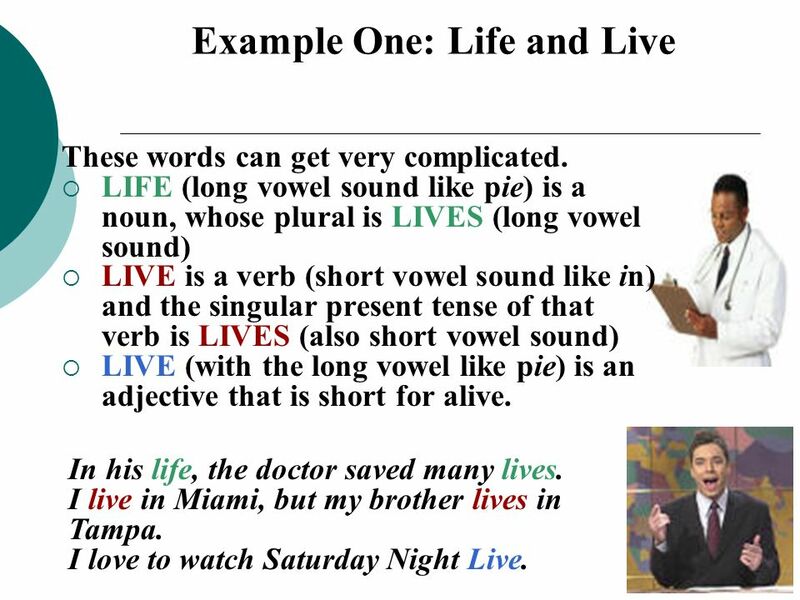 LIFE (long vowel sound like pie) is a noun, whose plural is LIVES (long vowel sound) LIVE is a verb (short vowel sound like in) and the singular present tense of that verb is LIVES (also short vowel sound) LIVE (with the long vowel like pie) is an adjective that is short for alive. In his life, the doctor saved many lives. I live in Miami, but my brother lives in Tampa. I love to watch Saturday Night Live. 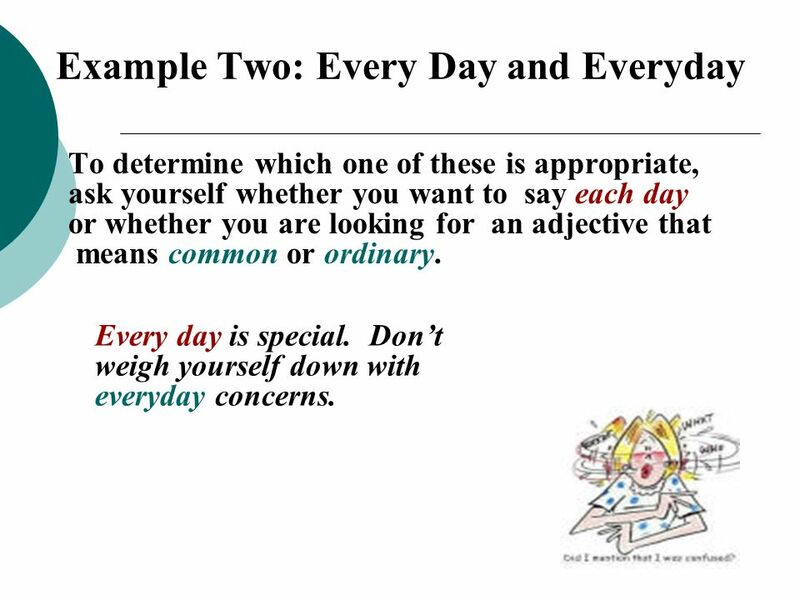 To determine which one of these is appropriate, ask yourself whether you want to say each day or whether you are looking for an adjective that means common or ordinary. Every day is special. Don’t weigh yourself down with everyday concerns. To affect is to influence or change. To effect is to bring about. An effect is a result or an influence. Ingesting alcohol affects her driving competence. Margaritas effect an undesirable change in his personality; he shouts and tells you that they have no effect on his speech. 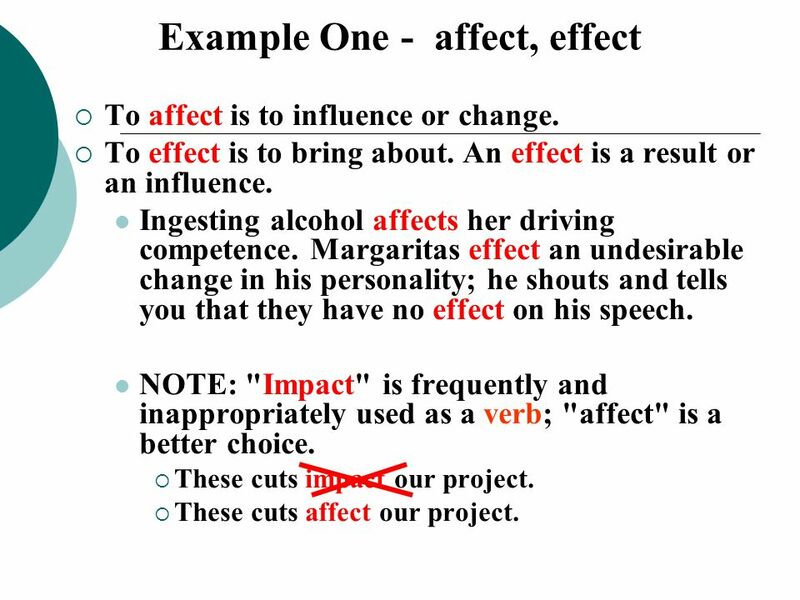 NOTE: "Impact" is frequently and inappropriately used as a verb; "affect" is a better choice. These cuts impact our project. These cuts affect our project. 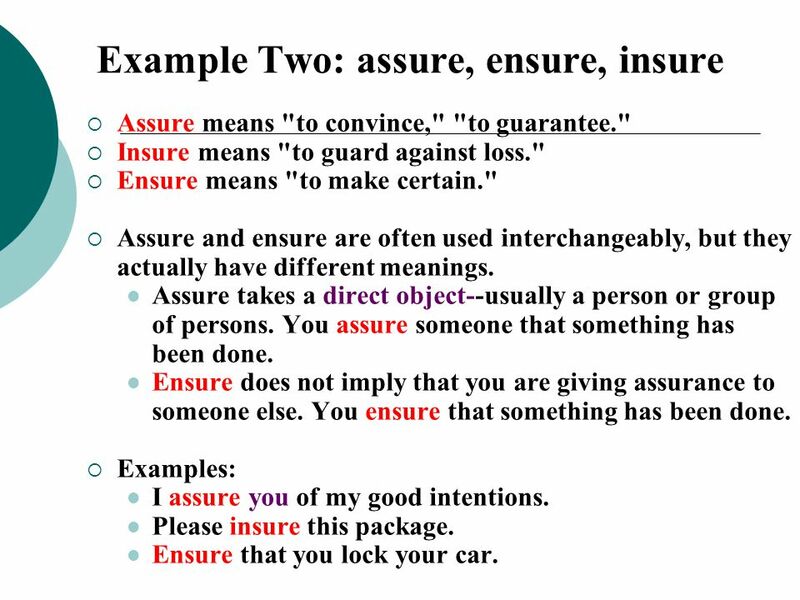 Assure means "to convince," "to guarantee." Insure means "to guard against loss." Ensure means "to make certain." Assure and ensure are often used interchangeably, but they actually have different meanings. Assure takes a direct object--usually a person or group of persons. You assure someone that something has been done. Ensure does not imply that you are giving assurance to someone else. You ensure that something has been done. Examples: I assure you of my good intentions. Please insure this package. Ensure that you lock your car. 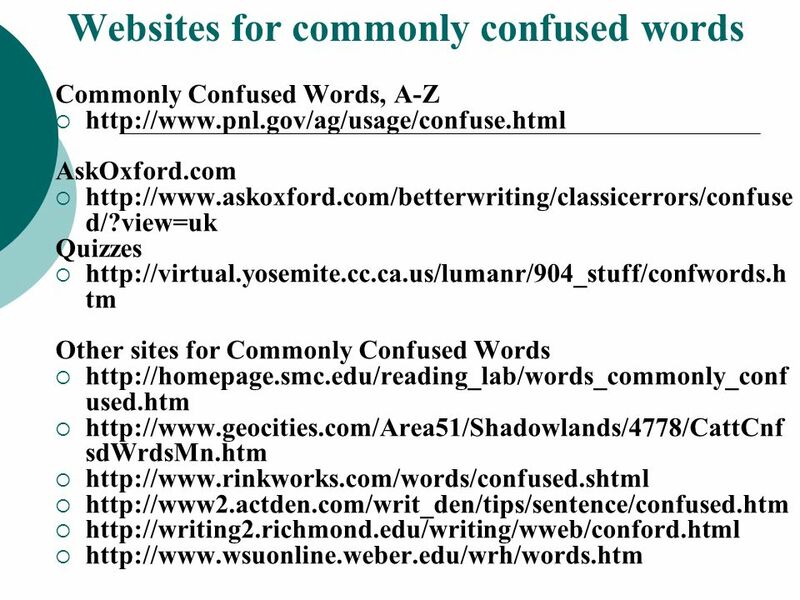 Download ppt "Commonly Confused Words"
Homonyms and Commonly Misspelled Words. 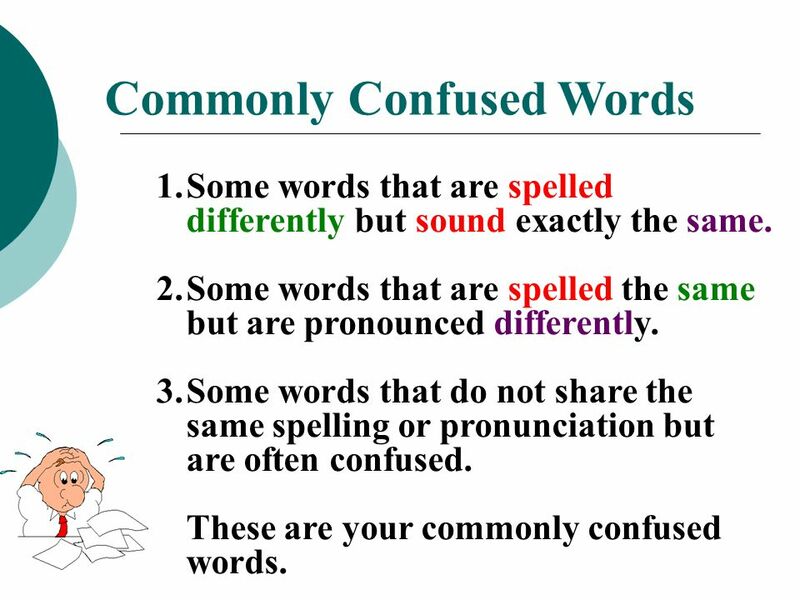 Commonly Confused Words Here are some words whose meanings are commonly confused: accept/except accept means to. To is a preposition which begins a prepositional phrase or an infinitive. Too is an adverb meaning "excessively" or "also." Two is a number. Who loves GRAMMAR?. So what exactly is GRAMMAR? There are 2 types of grammar. What are they? Prescriptive Descriptive. © Boardworks Ltd 2001 When you do a science experiment, it’s helpful to know the names of the equipment and materials you use. It saves misunderstandings. 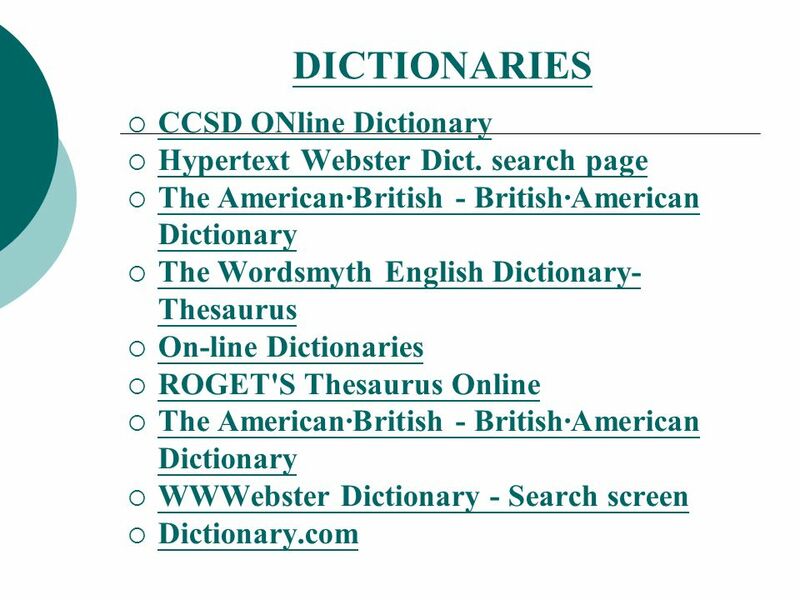 Spelling, Capitalization, and Abbreviations Frequently Misused Words from Rude, Carolyn. Technical Editing, 4 th ed. COMMONLY MISUSED WORDS 2322 – BRITISH LITERATURE. PRONOUNS LESSON 1. WHAT IS A PRONOUN? Pronouns take the place of nouns to name persons, places, things, or ideas. 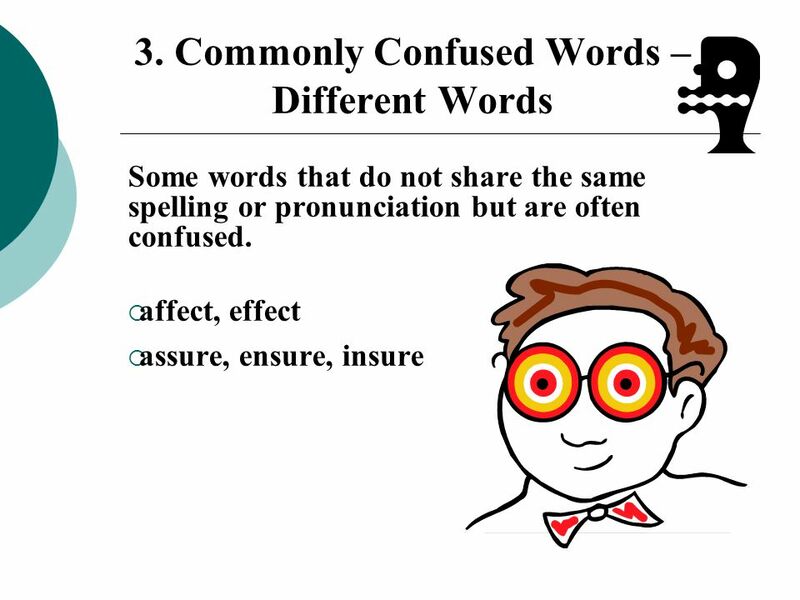 Commonly Confused Words Week #3 Anderson & Bult. Amount vs. Number  Amount = refers to nouns that cannot be counted.  Number = refers to nouns that. ACT English Test Prep Lesson 5 Hanyang University GAC Instructor: Samuel Kim. 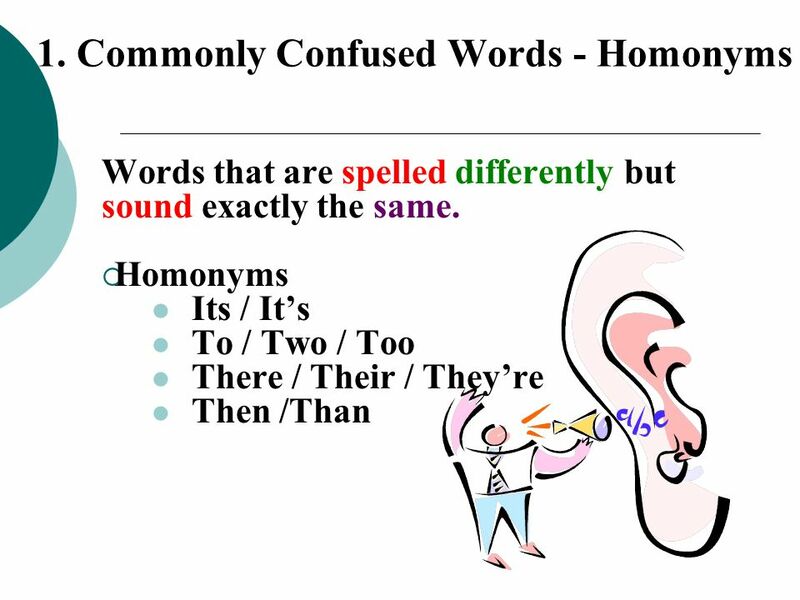 Homophones Sound alike But are spelled differently And have different meaning. Most Frequent Grammar Mistakes Solved!. Hers Hers is the third person singular feminine possessive pronoun - it replaces "her" + noun. Is this his or. Personal Pronouns A pronoun is a word that takes the place of one or more nouns. The most frequently used pronouns are called personal pronouns. They. Grammar Unit Pronouns. Let’s Review... The pronoun is the second of the eight parts of speech. Just for the record, here are all eight: Noun Pronoun Adjective.